This little lovebug is Casey. Casey is a rockstar on top of being beautiful. She has a bad case of luxating patella AKA floating kneecaps in her back legs and it was really crimping her style. For instance, when Casey wanted to run and chase other dogs she had to do so using three legs, since that pesky leg got in the way! 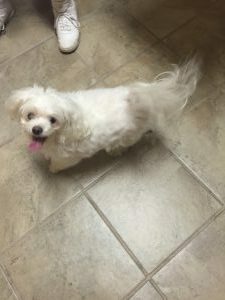 Luckily Casey’s mom was referred to us to see if we could help her darling little lady. When Casey first started seeing us her floating kneecap was popping in and out of socket with nearly every step. It was constant and she had lost a great deal of muscle tone because she didn’t want to use this leg. We knew this wouldn’t be a quick fix, but her mom was willing to give us a shot because she didn’t want to do surgery. Within three weeks our little Casey was already putting weight on that back leg. Within another three weeks Casey was using her leg more than she wasn’t, and by the end of two months this little girl was almost always using her back leg. Her kneecap would pop out but she was able to correct it, and this was only happening once every few weeks as opposed to daily. Casey hardly ever limps anymore and she’s faster and more energetic than ever. What may have been bleak chances turned into the best decision that could’ve been made for this love monkey. We are so proud of her progress!